An Anambra businessman, Bobby Uzochukwu, on Friday attacked Mr. Festus Keyamo (SAN), on the premises of the Anambra State Federal High Court, Awka, accusing him of “selling out” by accepting to serve as the spokesman of President Muhammadu Buhari’s 2019 re-election campaign. Keyamo was recently appointed the Director, Strategic Communications for President Muhammadu Buhari’s 2019 presidential campaigns. 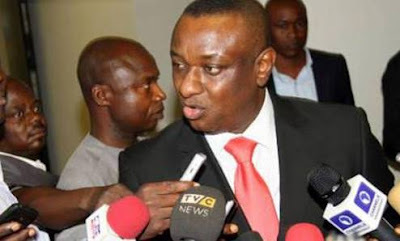 Keyamo, who was the counsel for a defendant in the August 6, 2017 killings at St Philip’s Catholic Church, Ozubulu, Anambra State, was addressing the press at the court complex when the businessman verbally attacked him, calling him unprintable names. The situation abruptly ended the press session as the Senior Advocate entered his car and left. Still fuming, Uzochukwu said he would have done “worse things” if the SAN had stayed back. He said, “I know Keyamo. He’s my friend. I was surprised when I heard that he accepted to serve Buhari. This is betrayal of the highest order. “We had thought Keyamo would replace the late Gani (Fawehinmi); but see what he has done, consenting to serve somebody who has no interest of the people at heart.